So for the past few months I've himmed and ha'ed. Should I get a new hat for summer? Or no? How many times would I actually wear it? etc. I scooped up a baseball cap without a second thought, because a baseball cap I'm comfortable in. A fedora or panama hat, I don't know! I have a crazy big head, will I look ridiculous?! And all these beautiful ladies make me think I need to just try!!! And the driving force behind this desire is my big summer vacation in a month. Thailand. While in the islands, I want to be covered, but stylish, but but....uggh, how do I travel with a hat like that? I don't want to crush it, but I'm traveling light so where do I put it?! Do I have to carry it? I can see that getting old, I mean it's halfway around the world! Should I just get it?! HELP ME! Ok, so I think I am the only one who isn't love with this panama style. The wide stiff rim is just too much for my big head & personal taste but I do see some people pulling it off. I much prefer a fedora that is a bit softer. I always wear mine when traveling or bring in my carry on so it doesn't get crushed. I love this hat and think it would be perfect for a vacation! I am pretty sure you would have to carry it though, even then it could get crushed in the overhead compartment. I say a stylish baseball hat and the old stand-by, the floppy hat! i usually wear my hat on the plane. my hair usually looks bad once i get off the plane and this covers it. and if you have to pack it, make sure you stuff it to keep it's shape. I've ordered this hat and I'm nervous for it to arrive! I have a feeling it might look funny on me but it is an adorable hat! 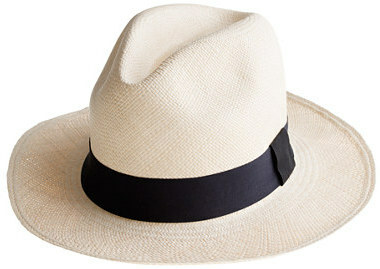 I love a classic Panama hat, I actually got mine at Target check that out if you dont want to splurge! I've been drooling over it for years; I think it's so classic and chic.